The Marc Walder BJJ Team is distributed among clubs from the south coast to the north of England. In order to ensure that advanced members of the team get to roll with one another and work their skills with people of their own level in a friendly way, Marc has started regular Brown and Black Belt Training Sessions which are hosted at Dartford BJJ. I am, patently, the luckiest, most spoiled and privileged girl in all BJJ-dom and was invited to last night’s inaugural session. The session had an informal open mat feel and Marc began by asking for any problems the guys might be facing, which led to an investigation of triangle escapes. In proper Walder style, this discussion of technique and the physical implementation of jiu jitsu was accompanied by his views on a philosophical approach to practice that might facilitate the practitioner’s personal evolution. In particular, the importance of trying different approaches to familiar problems in order to push one’s game, to develop one’s own style and to find one’s own truth. The remainder of the session was spent sparring and I, personally, enjoyed three super fun rolls with a selection of very forgiving brown belts (some more forgiving than others, but I appreciate the crushing as a sign of respect). What can I say, it was a tremendous way to end a week, it has me pumped for the coming week’s training and I am still quite stunned to have been hanging with these folks. It is quite thrilling to be immersed in such a concentration of advanced players; exciting to think I might develop that conceptual understanding, speed of thought, superb positioning, composure and timing for myself in the fullness of time. "In particular, the importance of trying different approaches to familiar problems in order to push one's game, to develop one's own style and to find one's own truth." For me, this is one of the hardest parts. I get into habits and my body wants to do those things automatically. Problem is, "those things" don't always work and other solutions are needed. I need to learn to be more adaptive. 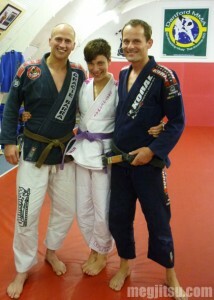 But I guess that is just another beautiful part of the bjj journey. It was a lot of fun, A.D. McClish! I here you, sister, yup my bod wants to play the comfort zone too! Working hard to break out of it, but it'll take time (lots and lots of time). Thanks for your thoughts, I love that you read and comment!